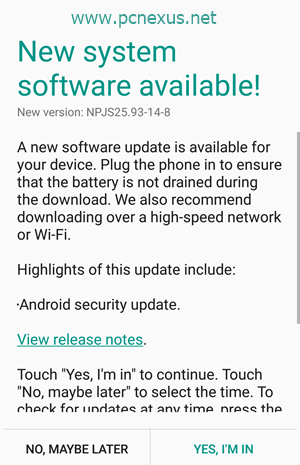 The Moto G4 Plus has now started receiving the June Security patch update in India. The newest update build is NPJS25.93-14-8 and it is just a maintenance update. This latest Moto G4 Plus software update patches the android vulnerabilities up to June 1st 2017. This update is not android 7.1.1 which is yet to be released for the Moto G4 Plus. This latest build also doesn't fix the screen burn issue that started on this after getting a security patch update last year in June. This update has already been rolled out in Brazil. Now users in India are getting it. The update weighs only 55.5 MB in size and requires your phone's battery to be charged to 50 percent or more. The update merely takes 10 minutes. So if you haven't received this update then go to 'Settings>About Phone>System Updates'. If you see an update then tap 'YES, I'M IN'. Then download the update and install it. Android security patch updates are crucial. You shouldn't skip these updates as these latest OTAs will protect your phone from android vulnerabilities. Any time whenever your phone notifies you about an security update then immediately install it. These updates are necessary for overall device security and safety. Not sure if my photos got effected with this update. Edit button disappeared. Unable to swipe to left or right to see next photo. Unable to open the complete folder. Vexed up with d issues. Last update made my phone to lower my ring volume automatically or may b no sound. This update has a charging bug. Everything is okay except the charging problem. The charging percentage sometimes shows wrong figures. We're using Google photos and the editing button is there. Don't use the stock file manager.